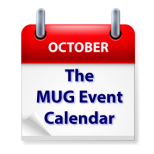 This week’s MUG Event Calendar is the busiest we’ve seen in a long time. Aaron Davis of Apple will visit a Virginia group and Jeff Carlson will discuss iPhone Photography with a Colorado group. Joe Kissell will talk to an Alaska group about, about macOS Mojave, and Bob “Dr. Mac” LeVitus will put in an appearance at a Pennsylvania group. Adam and Tonya Engst of TidBITS will join MacVoices host Chuck Joiner for a live recording of the show at a New York group, and Chuck will make a virtual visit to a Texas group as well. Other topics for the week include iOS 12, Security Practices, games, genealogy and more. Princeton Macintosh Users’ Group – Apple news — iOS 12, iPhone X, Apple Watch Series 4, et al — and how it might affect us. Ocala Macintosh User Group – Do You Trust Your Computer?